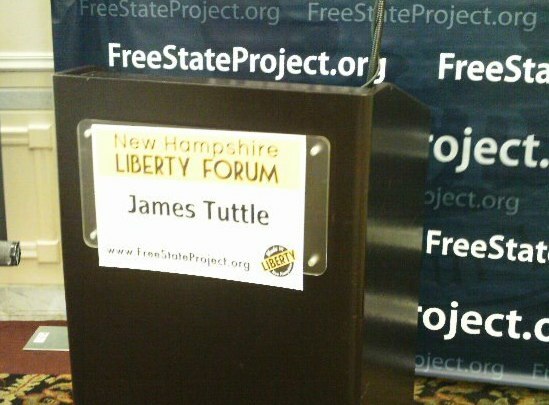 The following is a slightly edited version of the C4SS presentation for Liberty Forum 2013. From this MacLeod identifies two oppositional economic arrangements, socialism vs. capitalism, and differentiates two institutional spaces, the “free market” and “the state”. 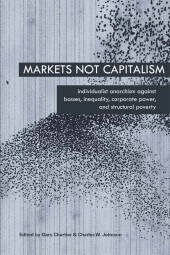 I hope to offer an introduction to a left libertarian conception of political economy that has emerged from many collaborative and challenging conversations within the market anarchist milieu, known as Freed Market Anti-Capitalism. We will start out by talking about C4SS, its mission and successes. Then present a couple themes to orient our approach to this subject, Freed Market Anti-Capitalism, and clarify a number of terms found in a typical left libertarian critique. And finally discuss how these change the way we talk about “markets”, with a focus on breaking down the time-honored notion of the “invisible hand” into the antagonistic invisible fist versus the resistant invisible molotov. My particular approach to traditional libertarian puzzles is heavily influenced by the work of Vincent and Elinor Ostrom. This, Ostromite, approach focuses on puzzles of institutional analysis and development, Institutional Economics, uses a version of methodological individualism, and has a respect for praxeological or hermeneutic issues without fully endorsing or committing to any. is an anarchist think-tank and media center. Its mission is to explain and defend the idea of vibrant social cooperation without aggression, oppression, or centralized authority. 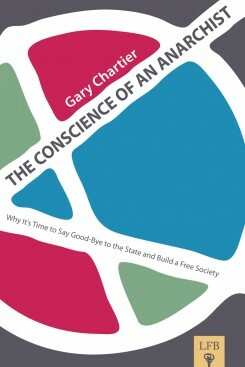 In particular, it seeks to enlarge public understanding and transform public perceptions of anarchism, while reshaping academic and movement debate, through the production and distribution of market anarchist media content, both scholarly and popular, the organization of events, and the development of networks and communities, and to serve, along with the Alliance of the Libertarian Left and the Molinari Institute, as an institutional home for left-libertarian market anarchists. C4SS was born October 10th, 2006, with the following press release: Anarchists Launch Major Media Offensive! Since October 2006, C4SS has published over 2,200 articles, to include 15 academic level studies. We have documented over 750+ reprints of our articles in mainstream media outlets. C4SS articles have been translated, by volunteers, into French, Italian, Portuguese, Dutch, Russian, Spanish and Swedish, and we have Media Coordinators for our Spanish and Dutch translations. And C4SS is proud to be the institutional home of the innovative and prolific Kevin Carson. I am not sure what the metrics for success are for the fringe of the fringe of the fringe of political theory, but considering that we pay our writers, are financed through micro-donations and partnerships, and are additionally staffed by enthusiastic volunteers and supporters, like myself, I feel we can reasonably claim a little success. Difara: Damage Identified, Find a Route Around. As with most vulnerable and conditional systems, the ability to see and move are crucial. But seeing correctly and moving concordantly with a goal – not just away from danger – are just as important. One can immediately see the peril and folly inherent in leaping off a cliff in order to avoid one’s own shadow. The ability to acknowledge and identify “damage”, whatever it maybe, is worthless, if we cannot act to avoid or change it. Yet all the mobility and flexibility in the world is equally worthless, if you don’t know what you want, what’s in your way or how it’s in your way. 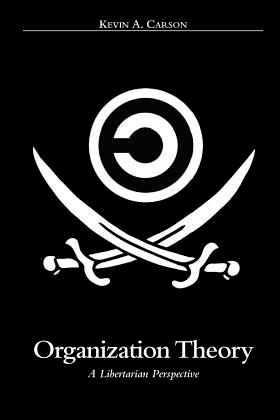 Within 4th Generational Warfare or Open-Source Insurgency discussions, Difara, can be closely aligned with the Boyd Cycle or OODA Loop (Observe, Orient, Decide and Act – Reflect-Repeat). The quicker or more accurately one can move through this loop – and repeat – the greater your chances of success. And if you are in a contest with another individual or organization, the more likely you are to set the terms or tempo of the match. The modern Westphalian Police State has a very tight decide – act loop because it tends to default to, “everything not me is my enemy” so “kill it with fire”. This may explain the anxiety and desire-stress – the emergency-heart attack – experienced by activists. Activists tend to have tight observe – orient loops and paralyzed, inoperable or slow decide-act loops. Imagine, as I am sure you have, being able to see a problem and recognize it’s relationship to you, but unable to decide what to do quickly enough to act appropriately or effectively. Open-Source Insurgency streamlines a number of the features of the OODA Loop by focusing on virtualization, repetition and RE,RO – release early, release often – deployment/development strategies. If we are good on OO, then why not streamline the DA. But, all organizational or institutional streamlining run a risk – SbyMC: State by Mono-centricism. Generally the state is regarded as a territorial or jurisdictional monopoly on the use force. Most libertarian projects focus on de-legitimizing or reducing this “use of force”, which is good, but a closer look at monopolies – what they are, how they shape and constrain, and how they creep into our institutions – is just as important. A monopoly on the use of force is undesirable, not only because it is force, but also because of its status as a monopoly. We are not morally discouraged or confused with the use of force in the pursuit of justice, in self defense, or even, I submit, in acts of extreme desperation – for aesthetic convenience think of a starving Jean Valjean stealing bread. Monopoly, on the other hand, is morally discouraging, and as it blocks our every attempt to “find a route around” our moral confusion grows until we either submit or explode. Roderick T. Long points out, in his article “Libertarian Anarchism: Responses to Ten Objections“, with monopoly comes moral problems; “why us? What’s so special about us?”, incentive problems; “why should I attempt to improve production, offer a lower price, or better quality?”, leverage problems; “if the monopolist doesn’t like me, for this or that reason, the price could become impossible to meet or impossibly contingent”, and knowledge problems; “how do I know I am offering the best product for the best price?”. If the state is understood as a monopoly and with it comes an inevitable and compounding cascade of legibility, incentive, knowledge and moral problems, then how do we guard against it? Where does the state come from? Is it like turning on a light switch, all of a sudden we have a state? Does it only come purposefully from one obvious direction? Or does it slowly fill in the spaces available, prohibited or abandoned from any avenue available? Herbert Spencer offers a sociological continuum that ranges from the Society of the Militant Type to the Society of the Industrial Type. From the regime of status to the regime of contract. The Militant Society exalts loyalty, orderliness, bravery, and nationalism. Its institutions are insular, conspicuous and rigid. The Industrial Type, by contrast, prizes novelty and personal liberty; it is suspicious of authority and nationality. Its institutions are less conspicuous and plastic. What makes this continuum approach insightful is that is offers us a framework for explaining the transition of a Militant Society into an Industrial One and, vice versa, a Industrial Society into a Militant One. Spencer anticipates or compliments, I submit, William James and Robert Higgs. William James describes the “moral equivalent of war” as a social program that can be used to marshal and order society towards the achievement of progressive ends. Robert Higgs demonstrates the Higgs Effect or the ratcheting effect of crises on society leaving a net increase in state power along with an increased desire and structural need for more war. For Spencer, war is also a dominate factor in the change of an Industrial Society into a Militant one. But war is not alone. Monocentric systems, by contrast, have reduced, singular, or hierarchical centers of power and decision making with fewer and fewer formally independent units. This reduction in the number of centers of power and decision-making can be accomplished in many ways, but two identified ways are know as “monocropping” and “monotasking”. Peter Evans describes monocropping as the “imposition of blueprints based on idealised versions of institutions whose applicability is presumed to transcend national cultures and circumstances.” Monocropping can also be achieved through the removal of what are perceived as useless redundancies. She goes on to document that these recommendations have lead to the decimation of social capital, local agency and participation particularly in the administration of education As Ostrom catalogs, “Currently (as of 2002), the number of school boards in the United States is still around 15,000. Thus, around 75,000 citizens are serving on school boards (instead of the 550,000 in the 1932).” “One consequence of this effort was the elimination of an overwhelming number of opportunities for regular citizens to engage in local problem-solving and politics. This reduction in “regular citizen” participation opens the door to what Butler Shaffer, in his book Calculated Chaos, calls the division of purpose. Monotasking takes place when, to quote from Thandika Mkandawire’s “Institutional Monocropping and Monotasking in Africa“, “institutions are reduced to servicing a standard set of often imposed policies or tasks and [reduced] from the endless institutional experimentation that renders them highly unstable and unpredictable.” There is a focus on institutions as instruments of restraint at the expense of regarding institution as the raw materials and points of reference for social experimentation, development and transformation. The two parts that make up Freed Market Anti-capitalism are designed around taking these concerns or themes, Difara and SbyMC, seriously. 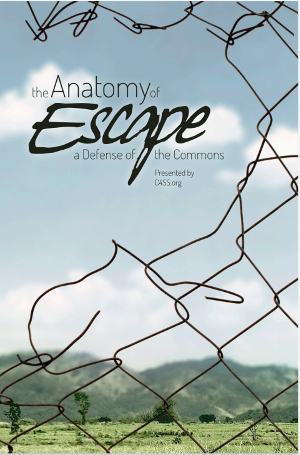 By rejecting one society we are implicitly endorsing its opposite, but it is an opposite of wide open space. “An impression has gone abroad that I am engaged in forming societies. This is a very great mistake, which I feel bound to correct. “This basic characteristic, the multiple centers of power, is the precondition for maintaining an open public realm. The open public realm, allowing for the functioning of various means of public contestation represents a second condition of existence for polycentricity”. Therefore, I submit, Freed Market Anti-capitalism is such a polycentric order, but what are freed markets, and what is anti-capitalism? They are two mutually informing and ruthlessly critiquing parts: Freed Markets and Anti-capitalism. First, it should be made clear that what I am calling “capitalism” is an institutional structure that is simply an expression of monopoly privilege, the economics of states, if you will, or, complexly a bundle of ethical-cultural-structural norms that suffer significantly from monocentric tendencies. Second, if your use of the word “capitalism” does not point to the economics of states or monocentric tendencies, then this critique does not apply to you, per se. But it may still offer some waypoints for navigating our situated and contaminated ideological contexts, avoiding vulgar libertarian misdiagnosis or vulgar liberal mischaracterizations of our state-full status quo. capitalism-1: an economic system that features property rights and voluntary exchanges of goods and services. capitalism-2: an economic system that features a symbiotic relationship between big business and government. capitalism-3: rule — of workplaces, society, and (if there is one) the state — by capitalists (that is, by a relatively small number of people who control investable wealth and the means of production). “Capitalism-2 is clearly inconsistent with capitalism-1, and so with a freed market. Under capitalism-2, politicians interfere with personal property rights and voluntary exchanges of goods and services to enrich themselves and their constituents, and big businesses influence politicians in order to foster interference with personal property rights and voluntary exchanges in order to enrich themselves and their allies. Kevin Carson refers to this as the subsidy of history. Through each act of state brutality society is further deformed, sculpted or conditioned into a submissive, desperate, dependent, property-less, or powerless working-industrious-employed class occupying the bottom segments of pyramidal structure of privilege. The economic landscape we see today is not one that has been brought about through peaceful voluntary cooperation. Whatever semblance of voluntaryism achieved or experienced has been in spite of and through struggle with this subsidy of history. The Two-Gun Mutualist, Shawn Wilbur, has likened the giant corporations dominating our economic landscape to exotic hothouse flowers lovingly nurtured within the state’s greenhouse. The flip-side of this simile is that if the greenhouse were ever damaged or removed the rest of us “weeds” would take them down or out. “One dictionary defines [capitalism] as ‘a system under which the means of production, distribution, and exchange are in large measure privately owned and directed.’ On the face of it, the meaning may appear clear enough. We can come in sight of the difficulty, however, if we turn the whole thing around and look at what is supposed to be signified, shutting out of our minds for the moment the word used to signify it. Suppose, that is, that we have a set of arrangements in which the means of production, distribution, and exchange of goods “are in large measure privately owned and directed.” I am acquainted with such arrangements, both from history and from some present-day actualities. These two points are crucial. If the “private ownership of the means of production” is capitalism, then what is our critique of the status quo? If what we want is what we have, then what is the crisis? If the process that brought it about is what causes us anxiety, is there a similar anxiety that a history devoid of large scale privileged violence might yield a non-capitalist out come? And if it would have, could this, in turn, bring about or warrant a consequentialist longing for such a history? Maybe a plan for the future? Regarding Carson’s second point, why single out one factor of production over others? Why capital over labor or land? Why material capital over social, human or network capital? “This is a very telling set of priorities: ‘capitalism,’ as opposed to ‘socialism,’ is not defined by the degree of economic freedom as such; it’s defined by a particular institutional structure which is disproportionately to the benefit of a particular class of market actors. On the other side of this perspective is the Freed Market. This step away from the present tense is important here, a free market implies points on a map where this community has a free market, but this one doesn’t. By shifting tenses we turn apologetics into perpetual ruthless critique. You’d be surprised how much of a difference a change of tense can make. 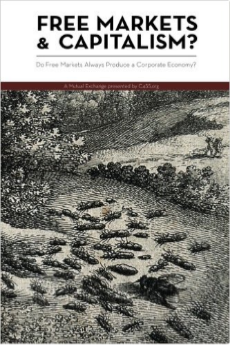 ‘Free market’ makes it sound like such a thing already exists and thus passively perpetuates the Red myth that Corporatism and wanton accumulation of Kapital are the natural consequences of free association and competition between individuals. But ‘freed’ has an element of distance and, whatsmore, a degree of action to it. … an implicit call to action. Charles Johnson, in the introduction to the book Markets Not Capitalism, offers another oppositional continuum between the Market Form vs. the Market Deformed. The Market Deformed points to discernible, identifiable violations of the Market Form. While the Market Form offers a never satisfied and searching critique of the institutional systems we find ourselves nested and embedded. Historically, within classical liberal, libertarian and anarchist discussions, one of the challenges inevitably brought to the defense of the status quo, is the question of social order. The status quo offers a semblance of order, legibility, regularity or predictability. The light-switch turns on the light-bulb, you can buy food at the grocery store, and our enemies are kept at bay; how would this be accomplished without a state. The answer to this question is typically The Invisible Hand. A theory of spontaneous order explains that even in the absence of “leadership” or “control” an order will emerge. But what kind of order will emerge and what role, if any, can we play in deciding its outcome. There is a neutrality to the Invisible Hand, the order that emerges may be benign or malign. It merely offers us a side constraint against types of organizing and a warning against unintended consequences. One of the ways we can describe this dichotomy between the spontaneous benign order and the spontaneous malign order is with the term the Invisible Fist. The invisible fist is that emergent order that constrains our options and our lives, the result of human action, but not the execution of any grand human design. The invisible fist can be used to offer insights into perennial, ubiquitous or inconspicuous structures of oppression like sexism, racism, or heteronormativity. As an Ostromite, panacea solutions are, to the best of my ability, removed from my strategic vocabulary, yet with that understanding, I would like to offer William Gillis’s Invisible Molotov. The Invisible Molotov embraces emergent orders, not as the pious desire to embrace their deity, awed by its power or grace, but as the readied aikido master, observant of its flow and eddies, prepared to turn, adding its force to our own or using its inertia to deflect its fist into the ground.